The above design by the artist, Robert McGovern, is based on concepts developed in the parish in response to the preliminary drawing. The central figure of Saint Vincent de Paul is embraced by the tree of charity. The Holy Spirit is represented in the peak of the window. Light emanates from above and bits of bright color continue through Vincent's hands to all corners of the window. Vincent's figure is high enough to be viewed from the nave and yet the integrity of the design is maintained for the total window, visible from Hatboro Road. Immediately after the sudden death of our founding pastor, Father William T. McBride, on October 21, 1998, parishioners began asking for a permanent memorial in his honor. Choir members were the first to suggest a stained glass window for the Church façade. The first reaction was overwhelmingly positive, but the parish received a reality check upon learning that the cost could be in the order of $150,000. Additional research and reflection led to the understanding that a stained glass window that size, with protective insulating glass and the necessary adaptations to the window frame, really would cost that much. Also, donations toward the window had already begun. In 1969-1970, as the construction contracts were being drafted for our Church, Father McBride chose Edward Byrne Studios to decorate the interior. He once told his successor, Father McLaughlin, that after the sanctuary stained glass windows were designed, Ed Byrne suggested a façade window featuring our patron. But finances were so tight that Father McBride said, "Ed, you better file that idea and make a note to have your successor talk with my successor about it." This history helped convince the Coordinating Committee that a façade window by the Edward Byrne Studio would be the appropriate memorial. The artist selected to design the window is Robert F. McGovern. Born and raised in Philadelphia, he studied at the University of the Arts, then the Philadelphia Museum School of Art. His works appear in churches, schools and hospitals throughout the U.S. He sees his task "as one of shaping and presenting images that enable the viewer to have a possible window from the finite to the infinite." The proposal is forwarded to the Regional Vicar for review and preliminary support. Pending preliminary support from the Regional Vicar and written authorization from the Office of the Vicar for Administration, we could engage an architect/engineer to prepare the preliminary plans for review by the Director for Capital Projects and the Chairman of the Archdiocesan Building Committee. The proposal is then forwarded to the appropriate Secretaries, soliciting their comments and recommendations. If all the reports are in order, the Secretary for Temporal Services/CFO, makes a recommendation to the Review Committee for Major Capital Projects to present the proposal to the College of Consultors, who meet quarterly. Further action can not be taken until receipt of written notification from the Office of the Vicar for Administration. 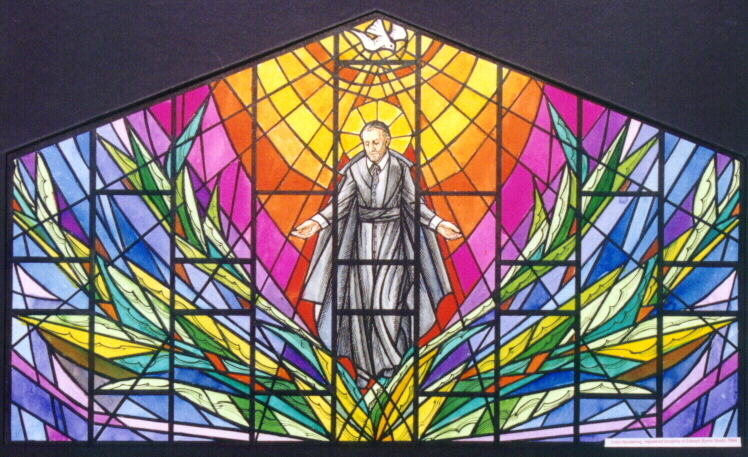 Having received preliminary support from the required archdiocesan offices, on April 22, 1999 Father McLaughlin signed a contract with the Edward Byrne Studio for the design of the window at a cost of $4,000. Parish reaction to the preliminary design led to requests for an image of only St. Vincent de Paul, without vignettes of his work, and a more accurate likeness for his face. The completed design and formal proposal from the Edward Byrne Studio arrived toward the end of July, received the approval of the Window Coordinating Committee and the Parish Finance Committee, and was submitted to the Archdiocesan Capital Projects Office in time to make the agenda for the September meeting of the Diocesan Counsultors. The price quoted for the stained glass window, additional insulating protective glass, and re-fitting the existing frame was $102,644. Details of the proposal and a picture of the design were included in the August 1, 1999 Parish Newsletter. At their September, 1999 meeting, the Diocesan Consultors approved our project. On October 15, 1999 the contract was awarded to the Edward Byrne Studio, and on October 29, 1999 the Archdiocesan approved contract was signed. The individual panes for the stained glass window were assembled off-premisis. Ed Byrne periodically provided progress reports  even pictures  which were published in the Parish Newsletter. In early March, 2000, the original glass was removed and replaced with clear insulated protective glass; at the same time the frame was re-fitted to accept the stained glass. The window was installed just after Labor Day, 2000, and blessed on Sunday, September 24, 2000, as the parish celebrated its patron's feast. Edward Adamow & Sons' removed the trees in front of Church and the original concrete walkway between the rectory and the entrance driveway. Interlocking Stone Systems installed new "paver" walkways, a small "plaza" at the main doors of the Church, and a seat wall. In the spring of 2001, Edward Admow & Sons' planted the new trees and shrubs now in front of the Church; parishioners Nick and Ida Roman assisted in selecting the plantings. Parishioner Gene Wolstenholme designed, executed and installed the memorial tree; its design far surpasses anything the Window Committee had encountered in its months of search. A team coordinated by Joe Ierubino, and including parishioners Jim Smith, Paul Haviland, Jim Love and Mohawk Electric's Jack Donohue, spent months of experimentation to arrive at an effective way to illuminate the window at night. With the help of Jim Smith, Pat Cosenza and Jack Donohue, new lighting is now in place in the choir loft, providing more light for the choir and less interference with the window lighting. As a spin-off of the choir lighting, we have been working on new lighting for the sanctuary and the front of the Church. In early June, 2002, Father McLaughlin, Joe Ierubino, Jim Smith, Jack Donohue and Jim Love came to general agreement on a new plan. Later we hope to improve the lighting in the body of the Church. Our fund-raising goal included the cost of a memorial recognition "tree," new landscaping in the front of the Church, lighting to highlight the window at night, and a 10% contribution to charity. Some donations had been received unsolicited from the time the project was conceived. The first formal request for donations was made in late December, 1999 via a rectory mailing which included a full color Newsletter, and an individualized pledge card. After much discussion, the Coordinating Committee had decided on different recognition levels for $1,000 and $500 contributions. The Coordinating Committee had also decided to recognize permanently donors or those whom they wish to remember by way of a Memorial Tree attached to the back wall of the Church. Some research on existing Memorial Trees in churches and institutions led the committee to a commercial artist who proposed a design with "boulders" and "leaves" for the different donation levels, with inscriptions on each in memory of a deceased relative or friend, in commemoration of a wedding, graduation, baptism, etc., or simply noting the donor's name. As contributions were received, the number of donations $1,000 and larger created far too many "boulders" for the original design, and prompted the Committee to search for a more creative design. Parishioner Gene Wolstenholme presented  and then executed  an original design which provides for a variety of "leaf" sizes to recognize different levels of donations. In addition, all donations will be acknowledged in a booklet being planned to remember Father McBride and explain the window.